If you find a Beanie Baby around Toronto, take it with you. It might be part of the Traveling Toy Project. Ryan the Beanie Baby was found in the schedule box at Roncesvalles' Revue Cinema. If you've recently spotted a cute and cuddly plush toy in an unusual location around Toronto, it might be more than child's lost toy. 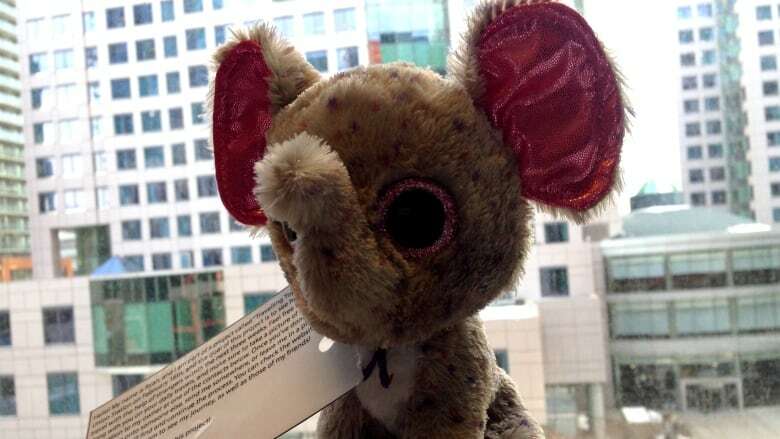 It might be a well-travelled toy elephant named Ryan. Ryan is about five inches tall, grey with bright pink ears. Over the last three weeks, Ryan has traveled across the city. CBC reporter Mary Wiens found Ryan last week when she opened the schedule box at the Revue Cinema on Roncesvalles. Ryan is part of the Travelling Toys Project. McKenna Deighton started it as a school project at the joint design program at York University and Sheridan College. The course she was in was called Material and Methods. The theme of the project was "chance." Students could do any art project based on that theme. Deighton decided to do an interactive project with a group of stuffed animals. She left her phone number, email and Twitter on tags on toys. In total, 16 Beanie Babies, each with note on around their necks with the information, were placed in a box at Union Station. They all have names randomly chosen using the top 100 baby names of 2015. The plan was for each toy to be taken by one person. That toy would be left somewhere in the city, with its photo taken and sent to her. And then the next finder of the toy would repeat the process. Deightonsaid it was based on trust. She believes that people are inherently good, and would not steal or destroy the toys. She wanted to prove that. Lo and behold, most of the toys were all passed along, unharmed, all over the city. "It proved that in a big city in like Toronto with all its craziness, people will take time to care for the toys," Deighton said. The Beanie Babies went well beyond the city though. One toy, Maddy the Penguin, made it all the way to Clearwater, Fla. Deighton was sent a picture of it in someone's backyard there. ​"It blows my mind that within two weeks it could get that far," said Deighton on Metro Morning Monday. There is a rumour one of the toys is somewhere in Greece, but that hasn't been confirmed yet. Isaac, the polar bear Beanie Baby, went to Blue Mountain. Charlie, a lion toy, went to a Bruce Springsteen concert in Buffalo. Sawyer, who is some kind of dinosaur, was taken to a Raptors game. Brooklyn has been taken hostage by staff at a smoothie shop in Eaton Centre. Out of the 15 toys, nine traveled somewhere. All the toys updates are on the website. Deighton was inspired by HitchBOT, the hitchhiking robot that made it across Canada. She wanted something to travel just like HitchBOT. She considered the psychological factor of having a really cute toy: People might be more likely to help out a cute toy. That's why she decided on the Beanie Baby toys. Also wanted the toys to be uniform, all the same so they would have the same chance of getting picked up. Some of the toys haven't completed their journeys as of yet, but alas Deighton's project is over. She presented the Travelling Toys Project to her class, and concluded it. But she said she is open to updating the site if she hears more from whoever has the toys next. "It took a lot of planning and effort," she said. "So I'm happy to continue."